You may have noticed 2 things: I love sandwiches and salmon! They are two of my guilty pleasures. I don’t eat sandwiches every day but at least twice a week! Easy to prepare and you can toss anything you have in your fridge: okay: almost anything! 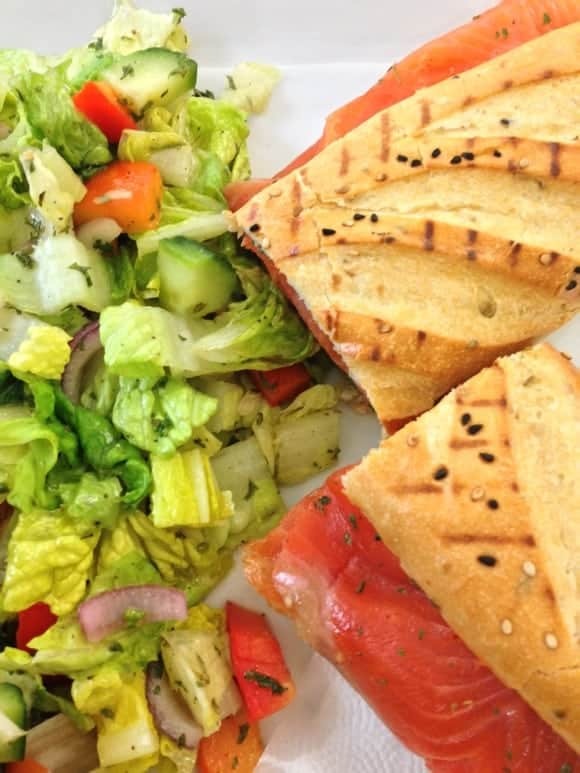 For today’s easy lunch recipe, I am sharing this salmon baguette sandwich with a salad as a side. The key for a successful sandwich is the bread: obviously! I used a fresh baguette from one of our local bakeries. We have a wide selection of bakeries in Montreal. I don’t advise you to visit them often or you may end up addicted and put on some weight! 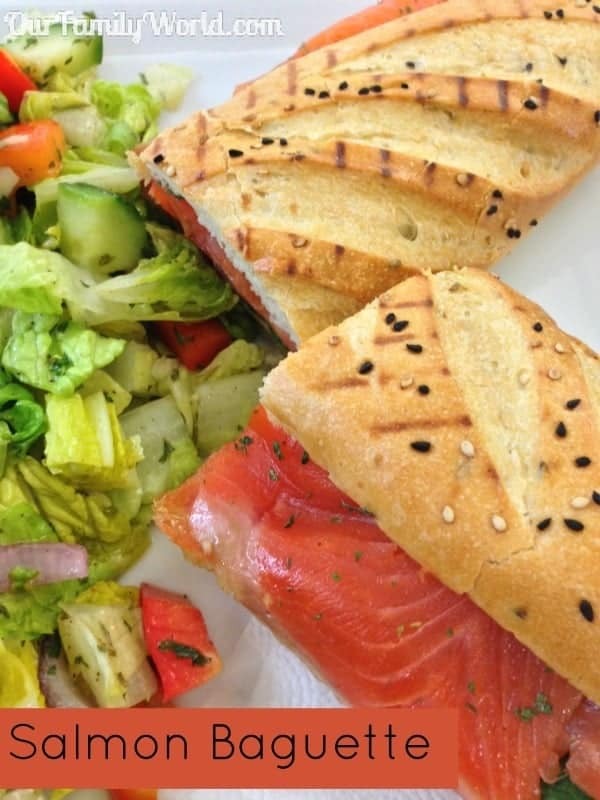 This salmon baguette sandwich and its accompanying salad really don’t get much easier to make! Take a look at how to prepare both parts of this easy lunch recipe. Cut the baguette in half. I chose a bread topped with sesame seeds for the extra texture, but you can go with whatever you like! Smoked salmon: I used thawed smoked salmon that I bought from Costco! It was on special so I had to buy it! With a sharp knife, cut the baguette in half down the middle. This easy lunch recipe isn’t just delicious, it’s also good for you! Salmon is rich in Omega-3 fatty acids, which may help improve brain functioning. Think of it as a power meal! Are you a fan of salmon? How do you love to eat it? Lovely lunch idea, will try making it! I adore smoked salmon, but I don’t remember to make it enough. This looks delicious! Pinned! I love smoked salmon! The only struggle I have is the smell when I’m bringing it to work.